Rick Mercer took on the online-privacy uproar in this week's rant. Rick Mercer's rant from last night has generated a lot of attention, and for a good reason. He brings a focus to the aftermath of the suicide of a gay teenager: that is, the bullies who made it happen. If you have a fear of heights, best to skip this segment, in which Rick heads out with a window-cleaning crew along Toronto's skyscrapers. 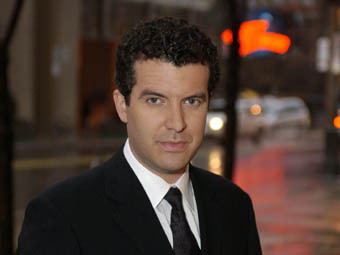 On Oct. 17, 1969, Rick Mercer was born. Some facts about Mercer: His middle name is Vincent. He grew up in Middle Cove, which he has described as a suburban outport. His first theatre group was Cory & Wade's Playhouse, which he formed in high school with Andrew Younghusband, Ashley Billard and Christine Taylor (and were they ever funny). He dropped out of high school, but earned an honorary degree from Memorial University. More on Rick here. He blogs, in season, here.